The pulmonary artery carries deoxygenated blood from the heart to the lungs. 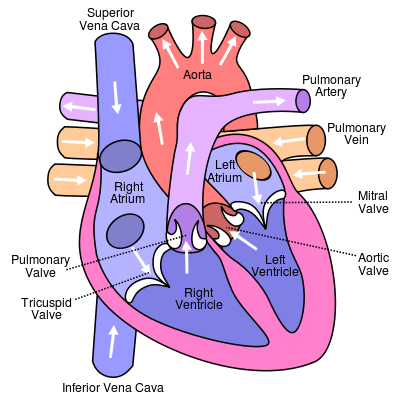 In the human heart, the pulmonary trunk (pulmonary artery or main pulmonary artery) begins at the base of the right ventricle. It is short and wide—approximately 5 centimetres (2.0 in) in length and 3 centimetres (1.2 in) in diameter. It then branches into two pulmonary arteries (left and right), which deliver deoxygenated blood to the corresponding lung. 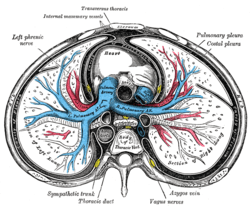 During embryological life, the ductus arteriosis connects the pulmonary trunk and the arch of aorta, allowing blood to bypass the lungs. 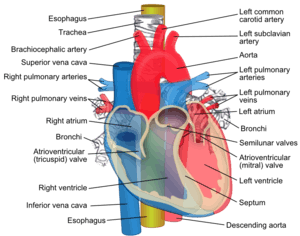 The pulmonary artery carries deoxygenated blood from the right ventricle to the lungs. The blood here passes through capillaries adjacent to alveoli and becomes oxygenated as part of the process of respiration. The pulmonary artery pressure (PA pressure) is a measure of the blood pressure found in the pulmonary artery. This is measured by inserting a catheter into the pulmonary artery. :190–191 The mean pressure is typically 9 - 18 mmHg, and the wedge pressure measured in the left atrium may be 6-12mmHg. The wedge pressure may be elevated in left heart failure,:190–191 mitral valve stenosis, and other conditions, such as sickle cell disease. Pulmonary embolism refers to an embolus that lodges in the pulmonary circulation. This may arise from a deep venous thrombosis, especially after a period of immobility. A pulmonary embolus is a common cause of death in patients with cancer and stroke. :720–721 A large pulmonary embolus affecting the pulmonary trunk is called a saddle embolus. Image showing main pulmonary artery coursing ventrally to the aortic root and trachea, and the right pulmonary artery passes dorsally to the ascending aorta, while the left pulmonary artery passes ventrally to the descending aorta. The position and relation of the esophagus in the cervical region and in the posterior mediastinum. Seen from behind.Crystal. Anatomy photo:20:01-0106 at the SUNY Downstate Medical Center - "Heart: The Pericardial sac and Great vessels"
Anatomy photo:20:07-0105 at the SUNY Downstate Medical Center - "Heart: Openings of Great Vessels into the Pericardial Sac"
Anatomy figure: 19:05-06 at Human Anatomy Online, SUNY Downstate Medical Center - "Mediastinal surface of the right lung." Anatomy figure: 19:06-02 at Human Anatomy Online, SUNY Downstate Medical Center - "Mediastinal surface of the left lung." 1 2 Larsen 2009, p. 157. ↑ Larsen 2009, pp. 159-160. ↑ Larsen 2009, pp. 176-179. ↑ Braunwald, Eugene. Heart Disease: A Textbook of Cardiovascular Medicine (Fourth ed.). p. 791. ↑ Braunwald, Eugene. Heart Disease: A Textbook of Cardiovascular Medicine (4th ed.). p. 790. ↑ Pashankar FD, Carbonella J, Bazzy-Asaad A, Friedman A (April 2008). "Prevalence and risk factors of elevated pulmonary artery pressures in children with sickle cell disease". Pediatrics. 121 (4): 777–82. doi:10.1542/peds.2007-0730. PMID 18381543. Schoenwolf ... [et al. ], Gary C. (2009). Larsen's human embryology (4th ed., Thoroughly rev. and updated. ed.). Philadelphia: Churchill Livingstone/Elsevier. pp. "Development of the Urogenital system". ISBN 9780443068119.